Photo #1: Note stripey flywheel: by painting 20 white and 20 black bands upon it, I am able to fool a low-cost model airplane tachometer into readings an order of magnitude lower than it was designed for. This way I get a reading in hundreds, rather than thousands and I can judge my engine's performance more accurately. To use this trick at night you need steady DC illumination: the AC-fliker from either incandescent or fluorescent bulbs will give wildly inaccurate readings. 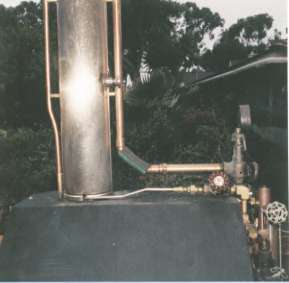 Photo #2: Stack plumbing, including in foreground the bent stainless tubing to the stack blower. 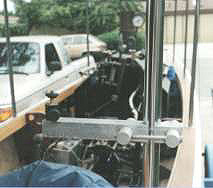 Curves were done with hand-made benders. 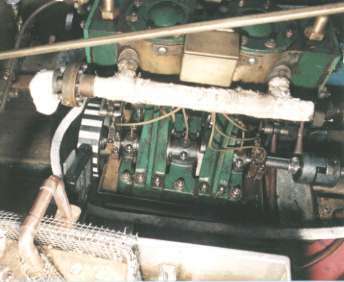 Note bit of automotive hose to couple the two 45-degree tube elbows together for the safety valve connection. 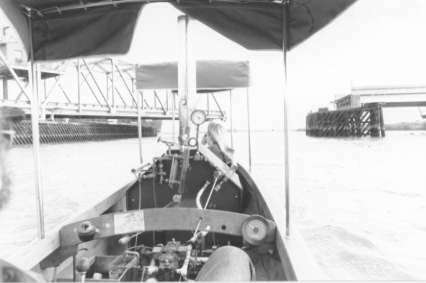 Photo #3: Captain's eye view: preparing to cross under the swinging bridge near the B & W Resort on the Delta in Northern California. The notch in the leading edge of the aft canopy lets me see what's going on at the top of the stack, without leaving my station. The shot was taken using a 28mm lens and a Nikon camera bolted to a home-made fixture that fastens to the Starboard Aft canopy stanchion. 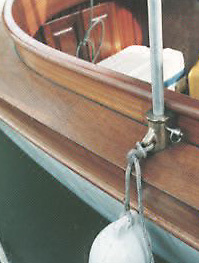 Photo #5: My home-made trailer is "notched" for skeg and prop clearance. 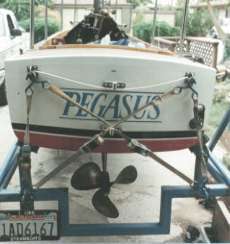 The four load-binders help hold the stern down on the trailer. One problem with a light-weight steamboat is that it likes to "fly" off the trailer at the slightest bump. Photo #6: This brass end cap covers the exposed rotating crankshaft on my Swan, making it a little safer to poke about in the bilges. 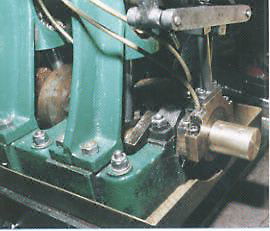 It also retains the shaft key for the forward cylinder's eccentrics. It is held in place by two flush-fitting stainless socket-head set screws. Photo #7: A nicely engineered and cast canopy support stanchion which includes a place to fasten a line. Photo #8: This is the well laced and braced canopy on Bart Smaalder's steam launch, Beaver. 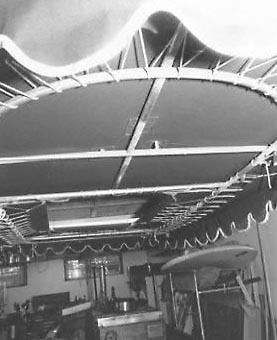 In order to keep it from getting dirty in the off season, the canopy is stored in the rafters of his workshop.